You all know by now that I love muffins, but I bet you didn’t know how much I love Oatmeal Raisin Cookies. My sister is in town visiting and we were talking last night about what I should make this morning. I was wavering between Oatmeal Raisin Cookies and Zucchini Muffins. She and I both love Oatmeal Raisin Cookies, but for some reason I was stuck on the idea of muffins for breakfast. At some point she said I should just make Oatmeal Raisin Muffins and once the idea was planted in my head, I couldn’t stop thinking about how to make a muffin that tasted like my favorite cookie. It’s not easy to make a muffin taste like a cookie. I needed to find a way to make the muffins taste buttery like a cookie without using a ridiculous amount of butter (because at that point, why not just make cookies). I decided that browning the butter might intensify the flavor enough to do the trick. I also had to fiddle with the amount of salt and sugar until I had a muffin that was reminiscent of a salty sweet cookie without actually being as salty or sweet as a cookie. The whole point of this effort was to end up with something to eat for breakfast that wasn’t quite as bad for me as a stack of oatmeal raisin cookies. I made these muffins three times before I got the combination right. The winning batch uses whole wheat flour and rolled oats, so you’ll at least get some fiber alongside your butter and sugar. With a cup of brown sugar in the recipe, I won’t make any claims that these are healthy. But like I said, I was just looking for something slightly healthier than a stack of cookies. I think I accomplished that. Now I’m packing up the rest of these muffins and we’re heading to the cabin for a few days. I’ll be back Sunday night to answer any questions or e-mails. Food Blog Friday will return next week. Have a great weekend, everyone! Melt butter in a small saucepan over medium heat. Allow the butter to melt completely and then cook – the butter will foam and start to crackle. Continue cooking, keeping a close eye on the pan, until the crackling subsides and little brown bits appear in the bottom of the pan when you swirl it. Remove from heat as soon as the butter solids have browned and it smells rich and nutty. Pour butter, including the browned bits, into a heat-proof bowl and set aside to cool. In a large mixing bowl, combine flour, baking powder, baking soda, salt, and cinnamon. Whisk together until well combined then stir in oats. In a separate bowl, whisk together browned butter, eggs, buttermilk, and brown sugar. Stir in vanilla extract. Add the butter mixture all at once to the flour mixture and stir with a large spoon until just combined (make sure to scrape up all the flour from the bottom of the bowl). Fold in raisins and nuts. Using a standard-sized cookie scoop or a large spoon, divide batter between the 12 muffin cups (the cups should be mostly full). Bake at 375 degrees for 20 – 23 minutes, or until a toothpick inserted in the middle of a muffin comes out clean. Oatmeal Raisin Cookies are my dad's favorite, I'll have to make these for him the next time he visits! These look awesome! Love this idea and great photo! These sound delicious! I can't wait to try them! 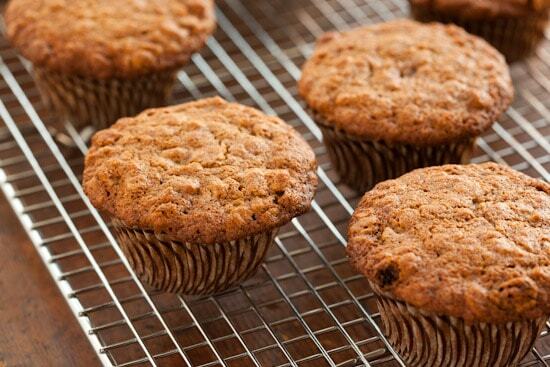 Wow, I've never had oatmeal raisin muffins, but they look amazing. Shiyate! I made these today for two little girls (ages 3 & 6) -- a big hit! Thanks for the great idea. (Substituted 1/2 c. whole wheat flour and 1 c. white flour for the pastry flour -- worked great. Also "made" buttermilk by adding 1 t. of vinegar to a cup of milk.). I've never tried oatmeal raisin muffins before, but these look so delicious I'm going to have to whip up a batch soon! I adore oatmeal cookies, even though I usually substitute dried cherries for the raisins. Your muffins sound delicious- what a great "pick up and go" breakfast! I love cookies so much more than muffins, but I'll try these out since I too can go through a stack of oatmeal raisin cookies. As somebody who can (and does) eat a stack of cookies for breakfast, I think this looks like a much better option! how could something with the words "cookie" and "muffin" in the title not be good? Yum! Nicely done. :) I hope you guys have a great get-away! Fabulous!! I love oatmeal raisin cookies, these look soo good. And they are healthy [ier] What can I use instead of pastry flour? Avanika: You could use any finely ground whole wheat flour (they might be slightly heavier, but should still work) or a combination of whole wheat and all-purpose flour - maybe one cup whole wheat and 1/2 cup all-purpose. I'm making these right now, they smell good! i want to make these with honey. How much honey do I need to add? Pls help!